Did you have a favorite ice cream novelty as a kid? I did. We didn't have anything like an ice cream truck in the backwoods of southern VA, but if we had, I would've chased it for as many miles as my little legs would take me for an orange dreamsicle*. These cupcakes stem from my fond memories of that treat made of vanilla ice cream covered in orange sherbet. I filled a lightly orange-flavored cupcake with a fluffy sweetened vanilla whipped cream and topped it with a luscious buttercream frosting beschpeckled with orange zest. I'll be the first to admit that, while amazingly tasty, these still aren't as good as I remember those dreamsicles to be. (I suppose there's a teeny chance that my memories are skewed.) Regardless, it's just a different kind of satisfaction. The flavor is similar, the cupcakes are soft, the frosting is rich, and those things, my friends, are enough for this gal. Preheat oven to 350 degrees. Line standard muffin tins with paper liners. To make the cupcakes, cream butter, sugar, and orange zest until pale and fluffy. With mixer running, add eggs one at a time, beating well after each addition and scraping down sides of bowl. Beat in vanilla extract. Reduce speed to low. Add flour mixture in two batches, alternating with the sour cream, and beating until combined after each. Divide batter among muffin cups, filling each 3/4 full. Bake, rotating tins halfway through, until testers inserted in the centers come out clean, about 25 minutes. Let cool in tins on wire racks. To fill the cupcakes, first whip the cream and sugar until slightly stiff. Fold in the vanilla. 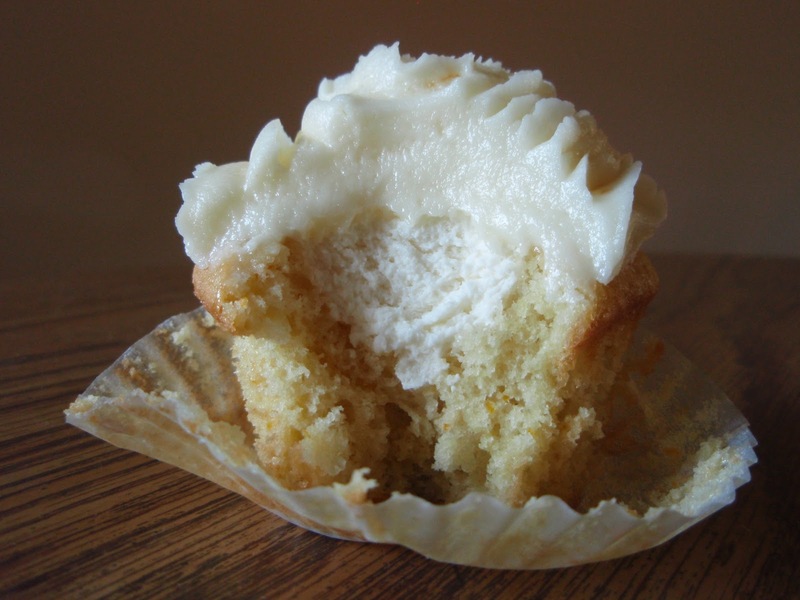 Then carve out a cone-shaped hole in each cupcake and carefully spoon or squirt the whipped cream inside. 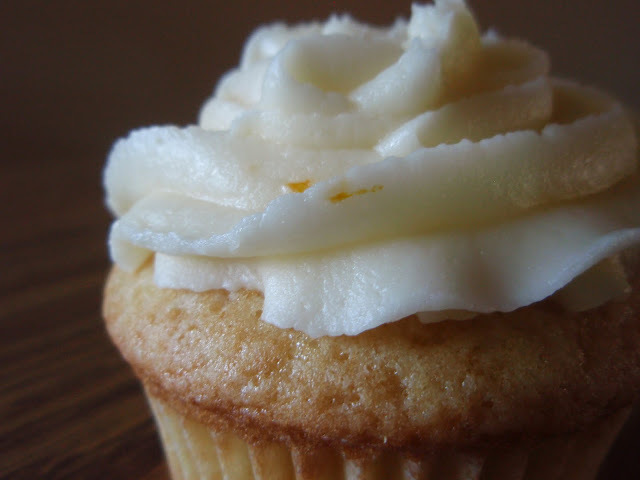 Apply frosting generously to cupcakes and, after giving the components a few minutes to get friendly, feed your face. Even if they weren't quite like the flvour in your memory, they do look amazingly good. Oh and we called those ice lollies an orange mivvy. Lovely cupcakes with wonderful flavours! You are the cupcake queen! These cupcakes look awesome! I'm using a lot of orange in my baking right now, and I think these cupcakes would be amazing. And, no matter how hard we try, I don't think anything competes with our childhood memories! Know what I love? I'm not a huge cupcake fan, I think they are often more faff than they are worth to make,and more about looks than flavour. Yours, they are simple and beautiful and all about the flavour. Love. These look pretty dreamy to me. I knew (know) them as creamsicles, but either way, the flavor combo is magical and the cupcake version looks amazing! I've never tried a dreamsicle, but I've always thought those flavours sounded fabulous. By the way, double thumbs up for the butterscotch goombah - very successful! I always wanted the Bugs Bunny ice cream with gum ball eyes. They were gross but i got the every time haha! We called them Creamsicles....and I loved them. Brilliant in cupcake form, Grace! I'm a biiig fan of fruity and creamy together so I suspect I would run alongside you to catch that imginary truck! As luck would have it, I'm attempting some blood orange frozen yogurt tonight. Not technically a creamsicle. But there will be orange ... and cream involved. So we (yes, me and the frozen yogurt) will be sure to give your cupcakes a shout out! Dreamsicle, Creamsicle I remember both names. When I was a kid, it wasn't one of my favorite combinations. However, after coming to my senses, I'm afraid I'd be running right behind you. Thanks for sharing, Grace...your cupcakes look "dreamy." These look so moist and delicious! My favorite ice cream is vanilla. Yum!! I would like to visit a smorgasbord of all the cupcakes you've been making lately. Is that possible? This looks like another delicious one! I think Dreamsicle is a brand and Creamsicle is the orange and cream flavor - or maybe both? Just a guess...I have no clue - whatever the answer that flavor combo is dreamy! I love citrus flavors in a cupcake so this wins in my book! Love your cupcakes, they are really nice. I"d take these in a minute! You'll been posting some incredible cupcake creations lately Grace. I need to get busy and try some of them. Orange creamsicles and orange sherbert are 2 of my childhood favorites. Childhood memories of the creamsicles are floating in my head. Lovely cupcakes. Wish I had one right now! It is a win win! I get to eat the little cones that are carved out and then I get to enjoy the ooey gooey cupcakes! Total deliciousness! I think I read somewhere you can't really trust a taste memory more than ten years old (or something like that, I'm sure I've made the number up). But who cares when you managed to make cupcakes that look absolutely dream(sicle)y! Very neat cupcakes inspired by Dreamsicles, yummy! my hubby loves orange dreamsicles, a little ice cream truck passes every now and then and he runs right out the door. I bet he would love these! Dreamsicles are still my favorite ice cream treat! I will have to make these. One of my favorite flavors of all time. We called it both names! Depended on which ice cream man company. They are dreamsicles. But I've also heard them called creamsicles. I made ice cream that tasted like them once. I can't make it again for fear of gaining 50 pounds every time. We called them creamsicles and they were hands down one of my favorite bars ever. I love a good cupcake though and while ice cream trucks are currently out of season, I'll be satisfying myself with these! I LOVED creamsicles as a kid. But, alas, I think they taste much better in memory than in fact. Put them into a cupcake, though, and I think you're on to something! We called them dreamsicles. They were my fav too. Great looking cupcake! Orange and vanilla is such a nice combination of flavor...love this cupcakes. Mmmm. I love the combination of orange & vanilla. YUM. My favorite ice cream as a kid was called Tin Roof Sundae. Yeah, I've always called them creamsicles, but regardless of what they are called, these look amazing!! Yep..I bet these are amazing!!! !